Terms: about, better, bring, carry, clean, cut, done, draw, drink, eight, fall, far, full, got, grow, hold, hot, hurt, if, keep, kind, laugh, light, long, much, myself, never, only, own, pick, seven, shall, show, six, small, start, ten, today, together, try, warm. 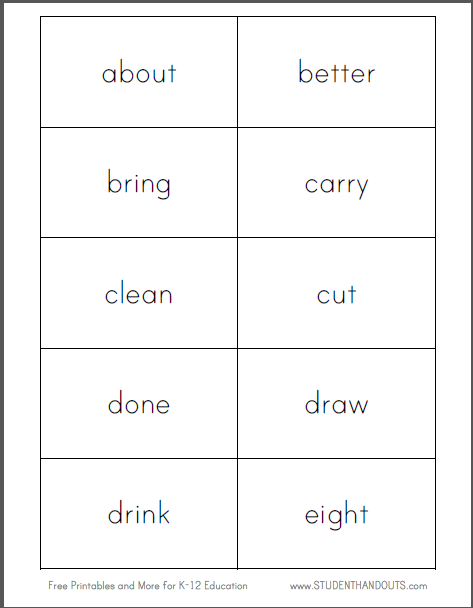 Click here to print these sheets of flashcards (PDF file). Click here for free printable handwriting/spelling worksheets featuring these words.